We also still have Water Is Life t-shirts, tote bags, stickers and prints available to raise funds for Raíces Cultural Center and our visiting artists Christie Belcourt and Isaac Murdoch’s language and culture camp. Place your order here. Join Raíces Cultural Center, more than 50 local and international artists, and a dozen community partners for our opening reception of the Water Is Life Art Exhibit Series. Meet some of the local and international eco-warriors working on the front lines to protect our waters and mother earth. *Assisted listening device is available for this segment of our program. Please contact 732-236-7618 by October 18 to request. See the original call for artists for Water is Life. Become a sponsor of this event and pre-order your Water Is Life T-shirts, Tote Bags, Sickers and Prints from the exhibit. Thanks in advance for your contribution, every bit helps us make this and future EcoArt and Preservation programs a success. Isaac Murdoch and Christi Belcourt will be visiting from their culture and language camp Nimkii Aazhibikong in Ontario. Prints, signed prints, t-shirts, tote bags, stickers and original artwork from the group show will be available throughout the exhibit to help raise funds for both Nimkii Aazhibikong and Raíces Cultural Center. Artwork remained on display through December 23! This program is made possible in part by funds from the Middlesex County Board of Chosen Freeholders/Office of Culture & Heritage and the NJ State Council on the Arts/Department of State. Special thanks goes to our community co-sponsors: the Highland Park Arts Commission, NJ Food and Water Watch, Lower Raritan Watershed Partnership, Sustainable Highland Park, Who Is My Neighbor?, Inc., the Highland Park High School Environmental Club, Middlesex County Conservation Corps, Modern Art Solutions, Tiger Art Supply, Blank Space Highland Park, Chamber 43, Okeanos Foundation for the Sea, Rutgers University Students for Environmental Awareness, Through the Moongate and Over the Moon Toys and the Highland Park Ecology and Environmental Group. Most importantly, special thanks to YOU, our community members, neighbors, friends and supporters, for helping us to make this happen! We couldn’t do it without you! From trash to treasure! 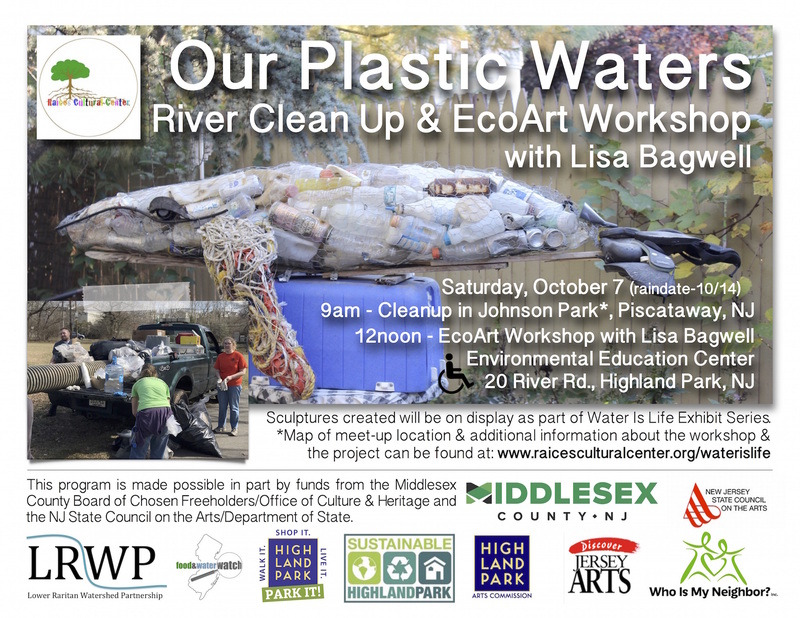 The Raritan River Clean Up and EcoArt Workshop with Lisa Bagwell was a heartbreaking, but successful event. Thank you to the 20+ water & earth protectors who came out to clean a quarter mile stretch of the banks of the Raritan River and stuck around to make three amazing fish sculptures out of the garbage collected which will be on display outside of Blank Space Highland Park during the October 28 Opening Reception for the Water Is life Exhibit Series. Check out the photo gallery from this event.